Do you have a go to recipe? One that is quick & easy to make, you always have the ingredients for, and your kids will actually eat? This is that recipe for our house. Whenever I haven’t planned a specific menu for the night, and have no motivation to even cook, I make these super Fast Chicken & Vegetable Rice Bowls with Peanut Sauce. My kids always gobble up them up and bonus, they’re full of vegetables and goodness. For some weird reason, my kids will do anything for rice. Seriously, they love rice so much. They’ll just eat a plain ol’ bowl of rice with nothing on it. Luckily, they don’t care if it is white rice or brown rice, as long as it is rice. So then I discovered that I could put something on that rice and they would still eat it up. Happy mommy moment! When we make this recipe, we use whatever vegetables we have on hand. That is one of my favorite things about this recipe (ok, maybe I should stop calling it a recipe because it is more like a guideline for a delicious dinner). We always include cabbage in it, sometimes we sauté the cabbage, sometimes we leave the cabbage raw for a bit of crunch. 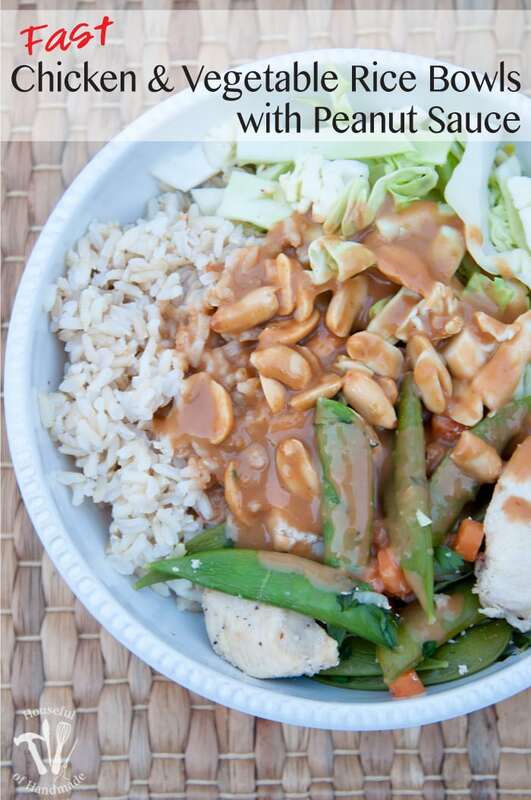 Sometimes we add chicken and sometimes we just make our rice bowls with vegetables. Just go with whatever you feel like that day! 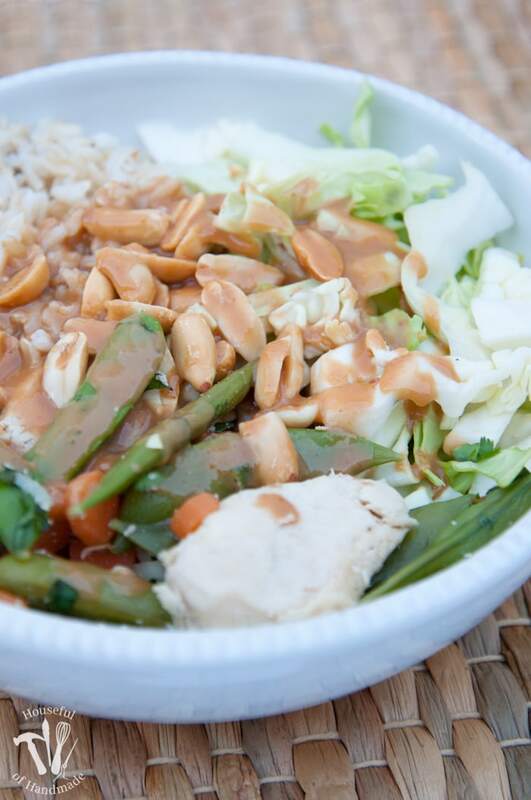 The only thing that is always the same is the peanut sauce. I have tried so many different peanut sauces, but when I first made these Asian Peanut Noodles with Chicken from Skinnytaste our family was hooked. You should definitely try her recipe, we still eat it often. One day I decided to make up a version of the sauce to add to our sauteed vegetables and ever since then, we always have this peanut sauce in a jar in the fridge. One recipe of the peanut sauce will last a couple meals and it keeps for a couple weeks in the fridge. You can just go ahead and drizzle it on everything, it is that good. Ready for one last trick to make this dinner come together super fast? Our family loves brown rice, but it takes about an hour to cook up a batch. Whenever I cook brown rice, I make a huge batch. I cook about 4 cups dry rice at a time in a large stock pot. Then I freeze it in portions that work for our family for dinner. When I need a quick dinner, I can quickly heat up the frozen rice by the time dinner is ready. Make a delicious dinner that can be on the table fast. 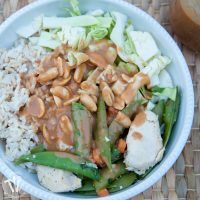 These super fast chicken & vegetable rice bowls with peanut sauce are the go-to meal for our busy weekdays at our house. Combine all ingredients in a small sauce pan. Whisk until combined. Simmer over medium heat until sauce becomes smooth and thickens. Prepare your vegetables: peel and slice carrots, chop broccoli into small florets, remove any stems from snap peas, slice mushrooms, chop scallions and cilantro, and thinly slice cabbage. Heat peanut oil in large sauté pan over medium-high. Add chicken and sauté until until cooked through. Add vegetables to the pan and sauté until tender but still slightly crisp (2-3 minutes). Add scallions and cilantro and sauté a minute more. To prepare rice bowls, layer cooked rice, cabbage, and chicken/vegetables. Drizzle with peanut sauce and sprinkle with peanuts. 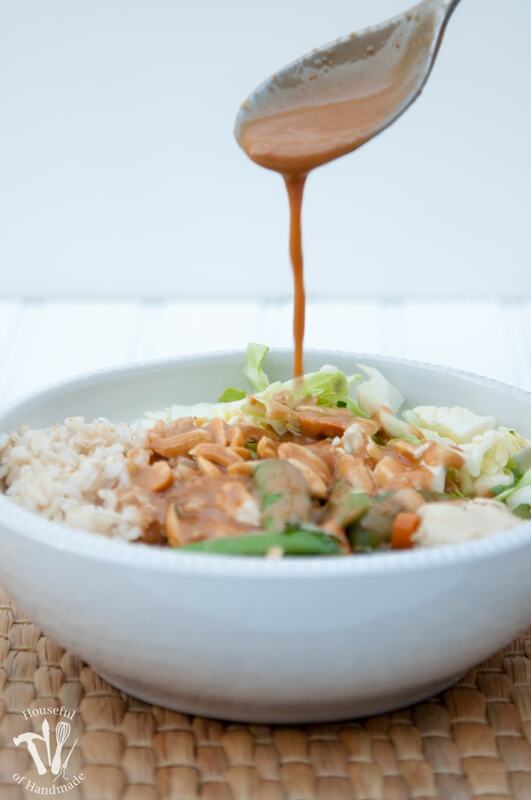 Store extra peanut sauce in a jar in the refrigerator for up to 2 weeks. Double yum! I love peanut sauce. I’m going to try your recipe. Thanks so much for sharing at Merry Monday. 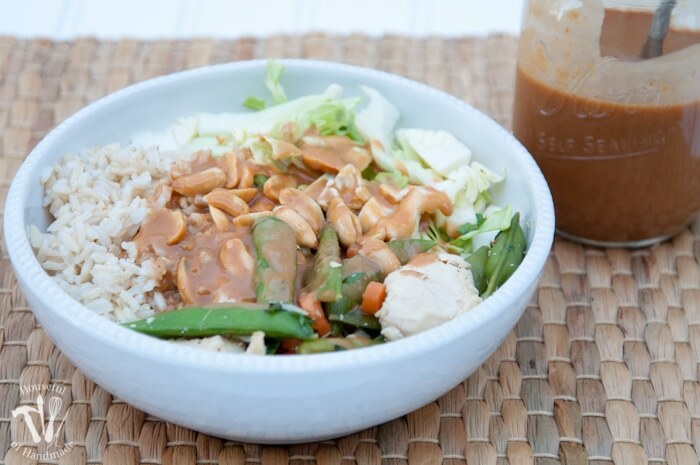 Seriously Sherry, peanut sauce is so good on everything right! Alton Brown (Good Eats) has a super easy recipe for cooking brown rice; easy clean up too! Oh, I love Alton Brown (and Good Eats)! I will definitely have to check it out cause rice can be a big pain sometimes. Thanks for sharing this on Dream Create and Inspire,the chickken and rice dish looks mouth watering.YUMMY,if you have a few stop by and visit, love to hear from you. 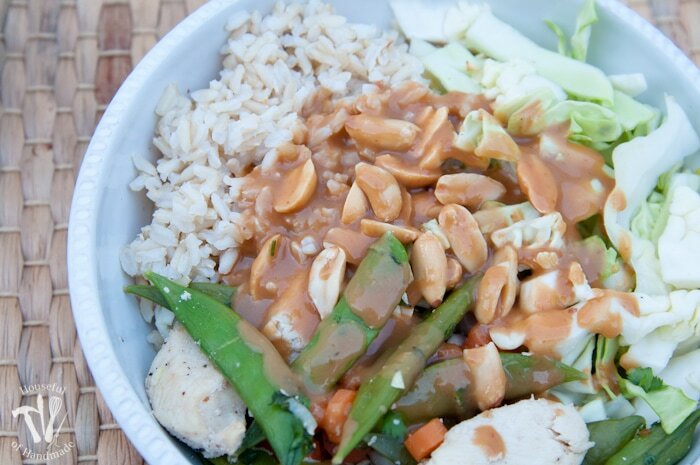 You had me at Peanut Sauce! I was even more excited when you said that it was quick chicken, veggie and rice that went underneath it! Look so yummy, I can hardly wait to try it. Pinned! I know peanut sauce is soooo good! I hope you enjoy it.